On our fourth day in the Keys, we had planned to drive down to Key West for the day. However, we both decided that we would rather just relax and enjoy our incredible accommodations then spend the day in the car. So that morning I went and got an revitalizing facial. I had originally planned to get a massage, but my poor sunburned skin couldn't take it. The facial was just what I needed, and after getting pampered Josh and I went over to...you guessed it...the Tiki Bar for lunch. It was wonderful as always...he had a scrumptious Cuban Sandwich and I had the club. Later that day, after some more lounging by the beautiful water, we went on a snorkeling excursion. The trip took us to two different coral reefs, and we saw so many beautiful fish, tiny squid and giant sand dollars. We also saw tons of barracuda! Every time one swam next to me I swam as fast as I could away from those scary beasts. Josh told me they rarely hurt humans...but I wasn't taking the chance. On our way to the reefs! After snorkling, Josh and I went back to our room to get ready for dinner. Earlier in the day, we had changed to the main part of the resort and with the new room came a new type of bathtub....so I had to try it out! 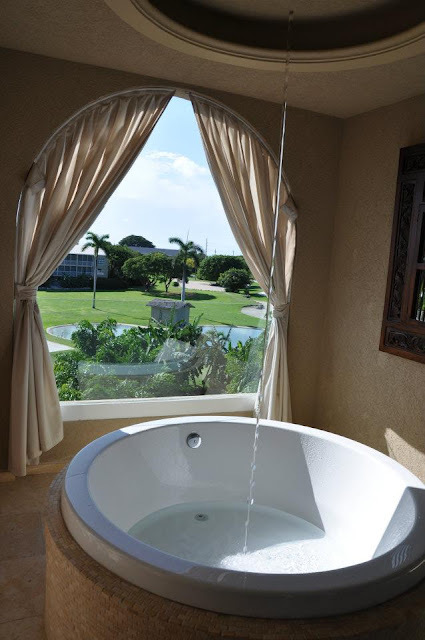 The tub is on the balcony of the room, and the water fills up the tub through a spout on the ceiling...spectacular! I loved it! For dinner that night, Josh and I decided to go to one of the fancy places in town, but we knew NO MATTER WHAT kind of dessert they offered we wanted Ma's Key Lime Pie one last time. So we picked up a slice on our way to dinner along with a slice of their Hummingbird Cake. Dinner was at Chef Michael's, and it was incredible. We started with a fantastic bottle of wine and two appetizers: a caprese salad and the seafood chowder. For our entrees, Josh had the wahoo and I had the lobster. It was a wonderful way to end our spectacular trip. The grande finale of the evening was eating our decadent deserts while staring at this beautiful skyline! The next morning we woke up early and headed back home. This trip was more than I could have ever asked for, and I am so thankful for my handsome man who treated me to such a great experience!